State of Fashion supports and activates the worldwide search for a fairer, cleaner and more sustainable fashion industry. We hope to connect designers, companies, governments, and educational institutions in fashion and textile as well as, in particular, the audience in this common endeavour. The first edition of State of Fashion opened on 1 June 2018 under the title Searching for the New Luxury, curated by José Teunissen. Searching for the New Luxury explores new definitions of luxury in response to urgent environmental and social issues: less waste and pollution, more equality, welfare and inclusiveness. It explores new (bio)technologies, digital platforms and creative processes that fundamentally rethink traditional notions of luxury and, in so doing, contribute to a sustainable future for the industry. state of fashion 2018 | searching for the new luxury collects current groundbreaking research and initiates experimental interdisciplinary collaborations that will start in 2018 and continue thereafter. My work is part of ArTEZ Future Makers. 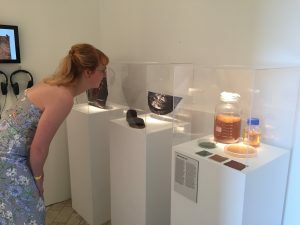 This project investigates and develops new ‘living’ materials (eg bio-based materials, textiles from micro-organisms, etc.) for the transition to a sustainable fashion system and a circular society. 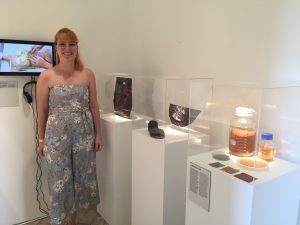 With the project ‘The Future of Living Materials‘ we connect fashion- and product designers engaged in artistic research and design research, to scientists and master students at Wageningen University & Research (WUR). In different lab projects they jointly develop new, sustainable materials – specifically in the field of fashion and design – to at the same time come to a new imagination and aesthetics which is essential for the transition to a circular economy and society. We also develop new concepts and business models to ‘market’ these materials. fashion industry, there is a great urgency to deal in a more ethical way with (raw) materials, and to question their value and meaning. The interaction between the creative, conceptual and aesthetic approach of designers and the fundamental scientific knowledge on sustainable materials of WUR is essential to develop innovative materials, insights and solutions. Together with Aniela Hoitink, I’m part of the Living Skin project which focusses on the ‘behavior’ of new materials such as mycelium and bacterial leather when worn on the human skin. This exhibition shows the ongoing research in microbial leather. Using a symbiotic mix of yeast and bacteria, a leather-like material is produced that has similarities with mammal leather. These organisms could be seen as mini factories, spinning threads of pure cellulose in a sweetened tea. Cellulose comprises about 33 percent of all vegetable matter and is the most abundant of all naturally occurring organic compounds. To apply the leather in -for example- the fashion industry, Emma is working on a completely natural coating in collaboration with a scientist. This coating enhances material properties such as viscoelasticity, solvability and hydrophobicity.